Protect your cues from getting knocked over or even worse, "borrowed." Just clamp this handy cue holder onto your table and keep your cues at your side. Your cues slip into a molded plastic clip that is sturdy, but soft, with no sharp edges to scratch or mar your cues. 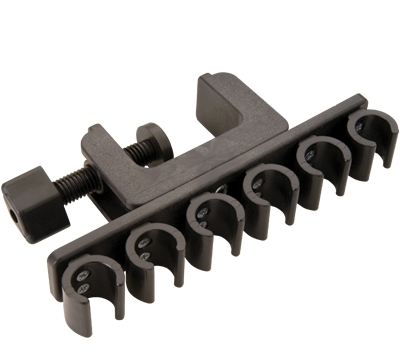 The clips are attached to a plastic base that rotates on an adjustable, extra large 2" clamp. The clamp has a large thumb screw, making it easy to install. The clips rotate into a vertical position so the cue holder fits right in the storage pouch of your cue case. Lifetime guarantee!